2008 Tesla Roadster at 2011 Greenwood Car Show, Seattle, WA. 1956 Nash Ambassador at 2011 Greenwood Car Show, Seattle, WA. Studebaker Hawk at 2011 Greenwood Car Show, Seattle, WA. 1940 Packard 110 at 2011 Greenwood Car Show, Seattle, WA. 1950 Jaguar Mark V at 2011 Greenwood Car Show, Seattle, WA. Studebaker at 2011 Greenwood Car Show, Seattle, WA. 1933 Plymouth at 2011 Greenwood Car Show, Seattle, WA. 1949 Cadillac Coupe at 2011 Greenwood Car Show, Seattle, WA. 1949 Cadillac Convertible at 2011 Greenwood Car Show, Seattle, WA. 1954 Ford Custom Line with KOM-PAC Sportsman's Trailer at 2011 Greenwood Car Show, Seattle, WA. Indian Motorcycle at 2011 Greenwood Car Show, Seattle, WA. 1931 Franklin at 2011 Greenwood Car Show, Seattle, WA. Pierce Arrow 8 at 2011 Greenwood Car Show, Seattle, WA. 1961 Lincoln Continental at 2011 Greenwood Car Show, Seattle, WA. 1942 Packard 180 Rollston All-Weather Town Car at the LeMay Car Museum, Tacoma, WA. 1925 Ford Model T Coupe at the LeMay Car Museum, Tacoma, WA. 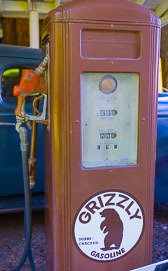 Gasoline pump at the LeMay Car Museum, Tacoma, WA. David Bradley brush cutter at the LeMay Car Museum, Tacoma, WA. 1975 Gaz 13 Chaika Soviet Russian KGB Limousine at the LeMay Car Museum, Tacoma, WA. 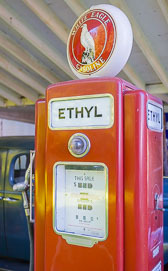 Service station sign at the LeMay Car Museum, Tacoma, WA. 1956 Chevrolet Bel Air Sedan at the LeMay Car Museum, Tacoma, WA. 1949 Buick Super Eight at the LeMay Car Museum, Tacoma, WA. Buick at the LeMay Car Museum, Tacoma, WA. Main garage at the LeMay Car Museum, Tacoma, WA. 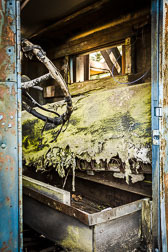 1920 White Boom Truck awaiting restoration at the 36th Annual LeMay Car Show on August 31, 2013. 1920 White Boom Truck at the 36th Annual LeMay Car Show on August 31, 2013. 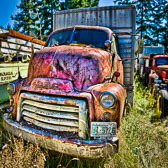 Rusted truck at the LeMay Car Museum, Tacoma, WA. Fire engine at the LeMay Car Museum, Tacoma, WA. GMC truck at the LeMay Car Museum, Tacoma, WA. 1920 White 6 Ton Truck at the LeMay Car Museum, Tacoma, WA. Fire engine detail at the LeMay Car Museum, Tacoma, WA. 1940 Dodge Military 4x4 Pickup Truck at the LeMay Car Museum, Tacoma, WA. 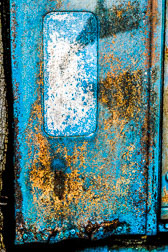 Handheld HDR using Photomatic Pro's Grunge option. 1938 Chevrolet Coupe at the LeMay Car Museum, Tacoma, WA. 1947 Ford Convertible at the LeMay Car Museum, Tacoma, WA. 1937 Chevrolet Master Deluxe Town Sedan at the LeMay Car Museum, Tacoma, WA. 1937 Cord S12 Beverly The "coffin-nosed" 812 Cord of 1937 was a styling and engineering marvel decades ahead of its time. Although development was done somewhat hastily, and on a strict, Depression-era budget, the shape was very advanced for the era. 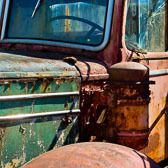 lts streamlined styling, pontoon fenders without running boards, pop-up headlights, chiseled Crocodile like hood, and verv advanced Lycoming-built, 288.6 cubic-inch V8 making 125 horsepower, fed through a four-speed transaxle made it a standout among virtually every other car on the road. 1937 Bentley 4 1/4 Park Ward Coupe. For 1937 Bentley used a larger 4,257 cubic centimeter engine, attached to a four-speed gearbox. The extra 588 cubic centimeters gives this car the same acceleration potential in fourth gear that the previous ear offered in third gear. This resulted in a very lively and sporty new model. This ear can reach 50 mph in just over 10 seconds and top out at 95 mph. 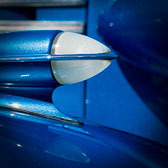 The particular sports a one off steel coachwork designed body by Paul Ward. It is one of just a few Derby’s with doors on the bonnet instead of louvers. It is a Wonderful example of a Bentley, the 'Silent Sports Car'. 1935 Packard 8 Dietrich Convertible Sedan. The Packard Super Eight was produced from 1935 to 1936. 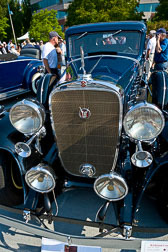 For 1935, the largest Packard Super Eight model was the Model 1204. It had a wheelbase that measured 139 inches and was fitted with a larger, 384 cubic-inch inline eight-cylinder engine capable of producing 150 horsepower. 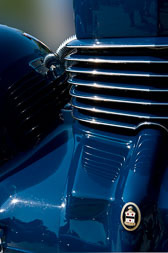 After 1933, all open Packard's were designed by Dietrich. 1934 Rolls-Royce 20/Z5 Brewster Town Car. 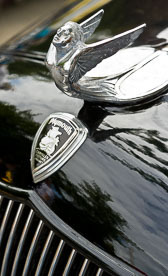 The Rolls-Royce 20/25 was built between 1929 and 1936 succeeded the 20hp as Rolls-Royce's "small car" . The new ln-line 6 cyllnder overhead valve engine was enlarged to 3699 cc and was fitted with a single carburetor. The 20/25 featured a four speed gearbox and synchomesh in the third and top gears. Thls car was delivered as a rolling chassis from England to the Brewster body plant in Long Island City, New York where it received the only town car body produced in 1934. 1937 Packard 12 Club Sedan. 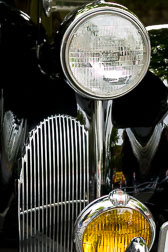 The Packard Twelve was produced from 1933 to 1939. 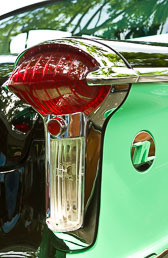 It is considered by many to be one of the finest automobiles produced by Packard and one of the most significant creations of the classic car era. This 1507 model was manufactured near the end of the classic car era and cost more than many moderate homes of that era. Powered by a 473 cubic-inch, twelve-cylinder engine, producing 175 horsepower and riding on a 139»inch wheelbase, this 19-foot long car can still cruise at modern highway speeds. This car has won multiple awards including best in class at Pebble Beach, it features hydraulic brakes, a synchronized gearbox and independent front suspension. 1937 Packard Super 8 Touring Sedan. 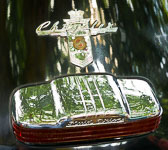 Packard entered the Classic era with a new straight eight engine replacing its early V12. This milestone engine used a unique crankshaft design and firing order that balanced the reciprocating forces and eliminated vibration. This wonderful new 13Ohp engine provided more power, better fuel economy and the inline configuration was compatible with the 'long hood' design themes that would be characteristic of the Classic era. 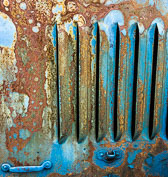 This particular car was sold by the Seattle Packard Company in january of 1938, it came fully-equipped with fog lights, luggage rack, radio, heater and dual side mount spares. 1937 Cord 810 Westchester, Supercharged. 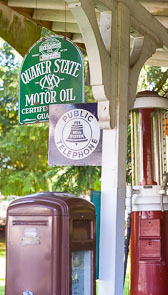 By late 1936 the 812 was offered with an optional supercharger and it became the ultimate Cord before the company closed indefinitely the same year. Central to the Supercharged Cord was a Schiwitzer-Cummins centrifugal supercharger that was attached to the L-head Lycoming V-8 engine. With 6 psi boost, it produced roughly 185 to 195hp. This was good enough to propel Abe Jenkins at an average speed of 101.72 mph for 24 hours on the Bonneville Salt Flats. 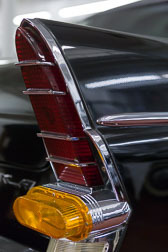 Only 51 supercharged Westchester Sedans were produced; this car is among the last eight produced. This Cord had just been driven round-trip (5,560 miles) performing flawlessly from Seattle to the National Auburn-Cord-Duesenberg Meet in Auburn, Indiana, where the car was manufactured. The ACD club celebrated the 75th anniversary of the 810/812 Cord. 1932 Auburn 12 Cabriolet. Auburn turned the industry on its ear with a new V12 for 1932. 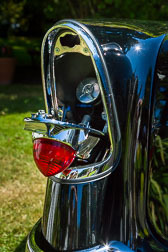 Designed by chief engineer George Kublin, it utilized a narrow, 45-degree Vee with horizontal valves in the heads, operated by a single camshaft through rockers. This 6.5-liter Lycoming engine produced a respectable 160 horsepower and enough torque to propel the vehicle to around 100 mph. 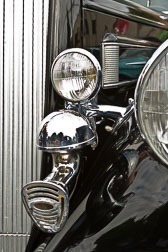 One of the most ingenious components of the vehicle was the 'Dual Ratio' differential which was operated by a dashboard lever. There were high and low ratios available for each of the three gears which improved fuel and oil consumption. 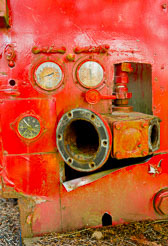 The end result was less strain and wear-and-tear on the engine. 1931 Packard 840 Dietrich Convertible Victoria. 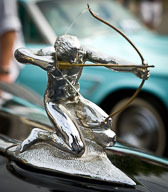 The Packard Company built a tradition and reputation for style, durability, quality and reliability. This eight-cylinder engine was very refined for the 1930 era. It was smooth, quiet and capable of carrying the vehicles at a respectable pace. 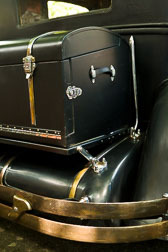 In 1925, the president of Packard, Alvan Macauley commissioned Raymond Dietrich to help produce an in-house line of custom bodies. 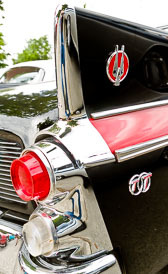 This created a profitable and exclusive line of Packards that are highly sought after today.